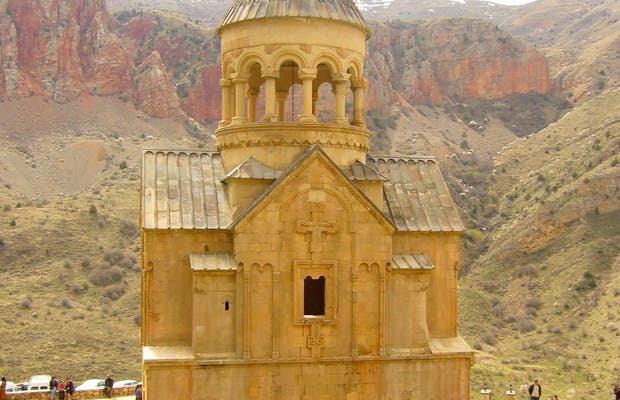 The best kept secret of all Armenia is located in a hidden canyon: the Noravank Monastery. "Noravank" in Armenian means "new monastery" (Նորավանք), and it's found near the town of Yeghegnadzor, in the region of Vayots Dzor about 120 km from Yerevan. It was built in the 12th century on the ruins of a 9th century church. The complex is formed by the main church of the monastery dedicated to St. John the Baptist (Surp Karapet), another dedicated to St. Gregory (Surp Grigor), one dedicated to the Holy Mother of God (Surp Astvatsatsin). Around the monastery in the sixteenth and seventeenth century were built the walls that still exist.